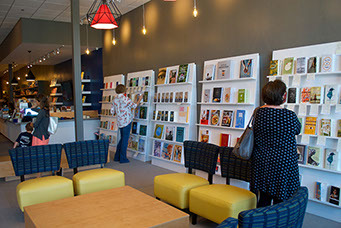 Interabang Books (left, and below, right), a new full-service, independent bookstore opened in May 2017. The 5,000-square-foot store, located at the southeast corner of Preston Road and Royal Lane, carries more than 12,000 titles in a wide variety of categories with a special focus on fiction, children’s books, and creative nonfiction. The store features a flexible event space with seating for up to 100 people for book signings and a children’s stage for weekly story times and other programs. The name of the store derives from punctuation mark coined in 1962 to combine the question mark and an exclamation point into a single symbol. 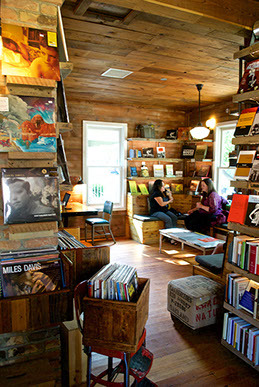 The bookstore is operated by book buyer Lori Feathers; Jeremy Ellis, formerly general manager of Houston’s signature Brazos Bookstore, and Nancy Perot, daughter of Ross. Interabang joins the growing literary scene of independent bookstores and venues that have sprouted around the Dallas area of late. The Wild Detectives (left), 314 W. Eighth St., established in early 2014 by Javier Garcia del Moral and Paco Vique, is a coffee-booze-book stop in Bishop Arts District. 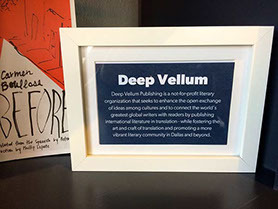 Across town in Deep Ellum, Anne Hollander joined Deep Vellum Books, 3000 Commerce St., as a co-founder, in 2016, with publisher Will Evans, who the previous year had launched a publishing house specializing in international literature in translation. In December 2016 USA Today named the bookstore one of the “10 Best Places to Shop in Dallas.” As of fall 2016 Evans has also partnered with film producer Dallas Sonnier to launch Cinestate, an undertaking with a seamless approach to creating films, audio productions, and books. 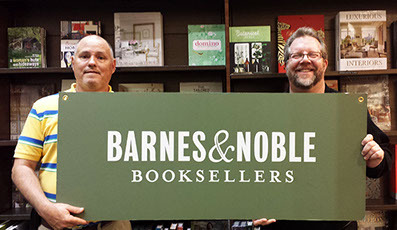 Barnes & Noble operates ten stores across Dallas and the greater Metroplex area, and two of those stores were picked by our readers in our previous years’ Readers Top Ten Favorite Bookstores—Dallas’s Lincoln Park and Frisco’s Stonebriar Centre. The country’s third largest bookstore chain, Half Price Books, is headquartered in Dallas, and its Mothership/flagship store is also a must-stop for any author touring a book in the Big D vicinity. Half Price Books has twelve stores across Dallas’s myriad suburbs and bedroom communities. In addition, the city is home to numerous specialty chains like Lifeway Christian Books and Mardel plus a dozen excellent used and rare bookstores. Much has been written about the burgeoning Dallas literary scene. In fact, some might even describe it as hopping, so to speak, as evidenced by the Deep Ellum Lit Hop. Scheduled for June, the free event is a well-read bar crawl experience inviting guests to wander between bookshops, art galleries, and bars to enjoy an eclectic collection of literary atmospheres. This one-day-only event, sponsored by Dallas literary nonprofit Wordspace, provides a showcase of literary expression in Dallas into one evening. Last year every venue was packed. Venues across DFW who participated included Dallas Poetry Slam, Verse & Rhythm, Lucha Dallas, Mad Swirl, Poets on X+, DaVerse Lounge, Spiderweb Salon, Pegasus Reading Series, Pandora's Box. A more sublime expression of literary reverence can be found in the Bishop Arts District. 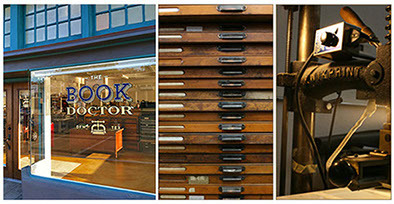 For nearly twenty years The Book Doctor, located at 1320 West Davis St. in Dallas’s now-trendy Bishop Arts District, has provided custom bookbinding, book restoration, and book and bible repair services. The Book Doctor approaches book repair and restoration with the intention of maintaining the original character of a book. By using excellent materials and methods, they can make your book last — whether your book is an heirloom, an antique, or an everyday volume. That’s a metaphor for the metamorphosis of the Dallas literary scene. By maintaining the original character of the city’s eclectic neighborhoods and cultural districts, the once all-but-dormant Dallas literary scene is being rehabbed to its original luster. Bookstores have become go-to hot spots for readings and other literary events, but Dallas-run reading series aren’t all brand new. Arts & Letters Live, hosted at the Dallas Museum of Art, is a literary and performing arts series that has brought in big audiences to see award-winning authors and poets since 1992. Participants have included Margaret Atwood, David Sedaris, Sandra Cisneros, and many other high-profile literary names. The Pegasus Reading Series, curated by poet Sebastian Paramo and Courtney Marie of Spiderweb Salon and often hosted by Kettle Art Gallery in Deep Ellum, showcases local and touring poets and writers. The Authors Live! 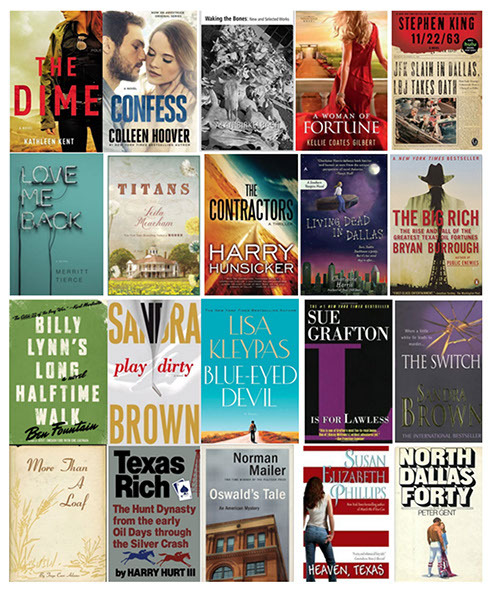 series, launched in 2011 and co-sponsored by Friends of the SMU Libraries, Highland Park United Methodist Church, and the Friends of the Highland Park Library, brings in some twelve to eighteen authors per year, many of them New York Times best-sellers and prestigious award winners. The city’s Highland Park Literary Festival, begun in 1996, is sponsored by HPISD families, La Fiesta de las Seis Banderas, HPHS PTA, HP Arts, and HP Kids Read, with the goal of inspiring and encouraging students, teachers and the community to celebrate language in its artfully written, spoken and sung forms. Besides bookstores and reading series, events and avenues for literary experiences include DaVerse Lounge, through Life in Deep Ellum, featuring open-mic spoken word and performance art. There’s also Pandora’s Box, a poetry showcase held at the historic Margo Jones Theater in Fair Park. The Writer’s Garret is a literary center that features programming, education, and outreach; WordSpace was founded back in 1994 to connect talent with local audiences. 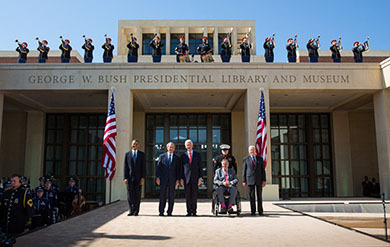 Located on the campus of Southern Methodist University in Dallas, the George W. Bush Presidential Library and Museum (left) serves as a resource for the study of the life and career of George W. Bush, while also promoting a better understanding of the Presidency, American history, and important issues of public policy. The Bush Library is the thirteenth presidential library administered by the National Archives and Records Administration, a federal agency. Housed inside the Bush Center, the library features a 20-foot-tall, 360-degree high-definition video wall; a full-size replica of White House Oval Office; and the original White House Situation Room, now the setting for a unique, interactive educational experience for students. Among the 43,000 artifacts held at the Library, the “Nation Under Attack” exhibit displays steel from the World Trade Center that visitors may touch, the bullhorn President Bush used to address the crowd at Ground Zero, and letters he received in the days following the attacks. Almost 70 million pages of textual materials, more than 1,200 cubic feet of audiovisual materials, just over 3.8 million photographs, 227 cubic feet of photo negatives, approximately 80 terabytes of electronic records, and about 200 million email messages are also housed at the library. 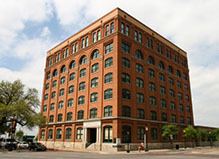 The Sixth Floor Museum at Dealey Plaza () is located on the sixth floor of the Dallas County Administration Building (formerly the Texas School Book Depository) in downtown Dallas, overlooking Dealey Plaza at the intersection of Elm and Houston Streets. The museum examines the life, times, death, and legacy of President John F. Kennedy, and is located at the very spot from which Lee Harvey Oswald, according to four government investigations, shot and killed the President on November 22, 1963. Left: Arguably Dallas's top book-related attraction, the infamous Texas School Book Depository (now the Sixth Floor Museum) tells the story of President Kennedy's assassination, Nov. 23, 1963. The museum's exhibition area uses historic films, photographs, artifacts and interpretive displays to document the events of the assassination, the reports by government investigations that followed, and the historical legacy of the national tragedy. Located across the street at 501 Elm, the Sixth Floor Museum Store offers a large selection of books, films, works by local artisans and distinctive pop culture memorabilia inspired by the 1960s and a café can be found there as well. The Dallas Book Festival promotes a love for books, reading, and literacy through multilingual and multicultural activities with a focus on spotlighting the city of Dallas and its wide range of ethnic and cultural diversity. This year’s event will be held Saturday, April 29, at the J. Erik Jonsson Central Library and includes headliners such as National Book Award finalist Paulette Jiles, and Jeff Guinn, national best seller of Western literary fiction. Tulisoma South Dallas Book Fair, with its primary focus on Dallas’s African-American community, occurs each August. “Tulisoma,” Swahili for "we read," is a community-based festival promoting literacy and the arts in the South Dallas/Fair Park area. The North Texas Teen Book Festival was supported by more than 20 school districts in 2017 and had an attendance of more than 8,000 the first weekend of March. This year it will be held in April 2018. 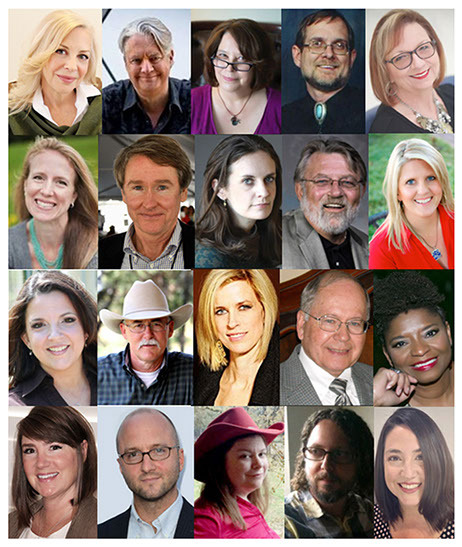 Authors (right) associated with Dallas include, from upper left, Kathleen Kent, Harry Hunsicker, Rachel Caine, Alan Birkelbach, Kellie Coates Gilbert, Becky Wade, Ben Fountain, Merritt Tierce, Clay Reynolds, Melissa Lenhardt, Donna Grant, Reavis Wortham, Suzanne Frank, Richard Mabry, Sanderia Faye, Kendall Lynn, Matthew Bondurant, Tex Thompson, Joe Milazzo, Catherine Cuellar. For help in planning your Dallas visit, go to www.visitdallas.com.